It’s one thing to be found on Google Maps or a general Google search for “gym in [city name].” However, it’s another thing to allow potential members and clients the ability to go inside your facility before they even arrive. No, this isn’t a magic trick, it’s “Google Street View Virtual Tours” and in this blog we’re going to guide your through the basic “how’s” and “why’s” of creating your own indoor virtual tour for your Google business listings. Why should I have a virtual tour for my gym business? According to Google, “listings with photos and a virtual tour are twice as likely to generate interest. *” Reason enough? We think so too! 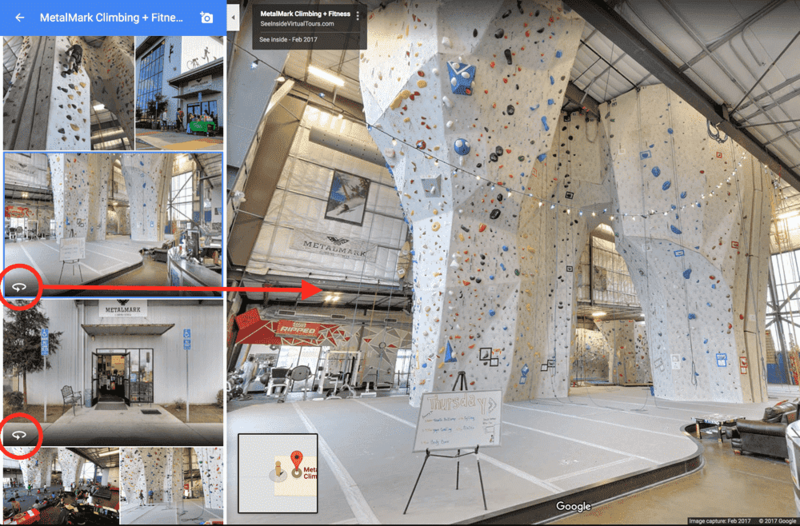 If you have any experience using Google to search for a business, you’ve probably seen an option to view the inside of the business using a 360° photo. If you’re not sure what we’re talking about, this is typically what it looks like. Adding 360° tours to your Google business listings can be rather easy to accomplish. Even the more complex version of hiring a professional (we’ll get to that in a minute) isn’t very time consuming or complicated. However, if you want to do this yourself, there are some things you should know. DIY: How to generate your own 360° virtual tour. Technically, all you need is your smartphone and the official Google Street View app which is available for both iPhone and Android. It’s another project for you, which we are guessing you don’t need. Unless you’ve done this before and/or have excellent equipment you probably won’t see the type of results you’ll get from a professional. The quality of your 360° photos is so important that we’re putting it again in this list. 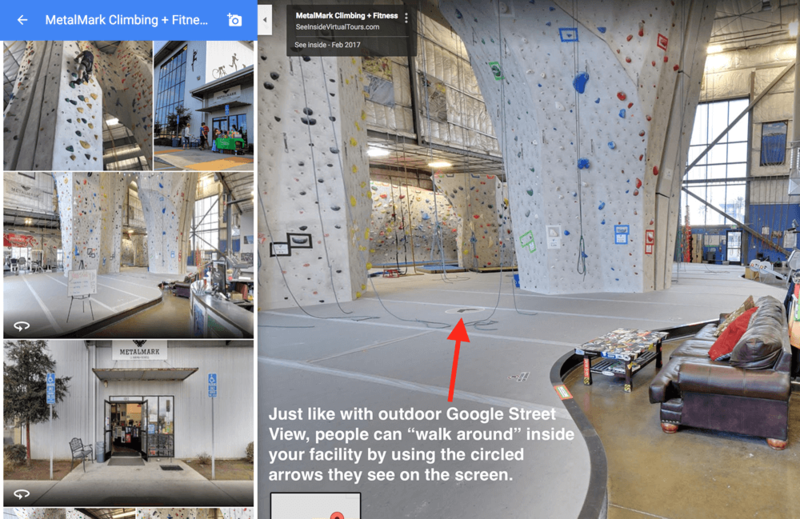 The reason having a quality 360° indoor photo and/or virtual tour is so important is because Google automatically shows the most popular photos first. 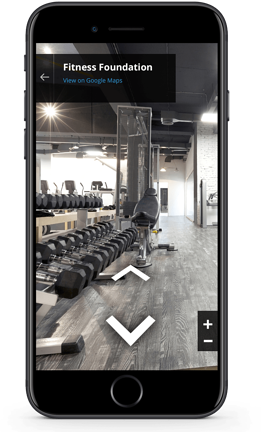 So if you put forth a less-than-awesome quality 360° indoor photo, it may be pushed down below some photos that won’t be as helpful to anyone trying to find out if your gym or fitness business is the one they want to visit. Bonus: Looking for a side hustle? Why not become a Google Maps pro yourself. Don't want to take on another task? Hire a pro to take your 360° photos. As you may remember from our blog on taking the best photos at your gym, we are pretty big into hiring professionals if you want a job done right the first time. Our opinion is the same when it comes to these even more advanced 360° photos. Typically for a one-time payment, you can have a professional come in and complete the photography in less than a few hours and - unless you make sweeping changes to your facility - you don’t need to have another one done again for a while (or as long as technology doesn’t catch up to make your current 360° photos look bad). It’s incredibly easy to find a Google Maps Pro in your area, just go here and scroll to the bottom and enter your location information. And if you’re curious how the process goes once your professional arrives, consider watching this incredibly warm and fuzzy video made by Google. Preparing for 360° photo day. If you hire a professional, they will assist you when it comes to selecting the best time and day to take the photos. Whether you're going the professional route or not, you’ll want to ensure your facility is clean and inviting. There can be people in the 360° photos, but that’s typically not recommended. 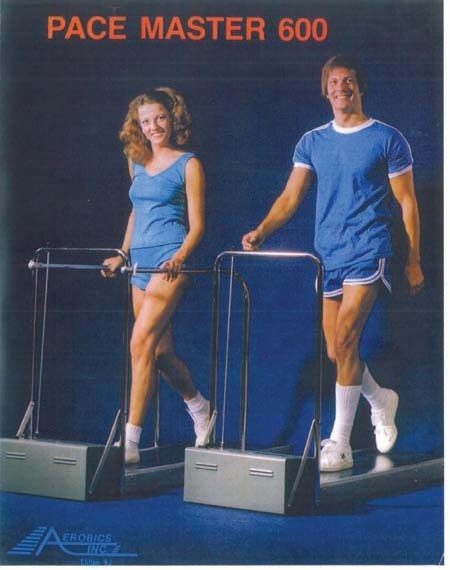 One potential downside of having a 360° photo is if your facility isn’t to the level you’d like it to be and you don’t want anyone seeing inside like this before you have a chance to give them a tour, or explain why it’s a good thing your treadmills are from 1988. However, we still recommend that you consider the benefits of adding a 360° indoor your to your Google business listing. After all, if you don’t, someone else might and they definitely won’t make your business look as nice as you or the person you hire will. Oops, did we not mention that yet? Anyone can upload 360 photos of your business and Google will automatically show the one they think is the most popular. How do I know if it’s helping? Great question! Systems like Club OS are very focused on using data to help make decisions, so it's easy to see the value in knowing if you’re wasting your time on an initiative or if it’s actually helping. 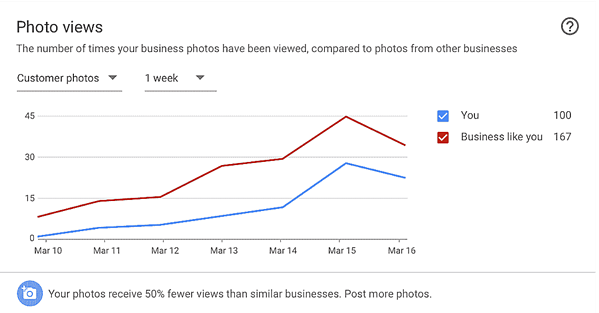 While the metrics may be pretty simple when it comes to your Google listing photos, it’s probably something your competition isn’t aware of and as you know, every little bit helps you to stay competitive. 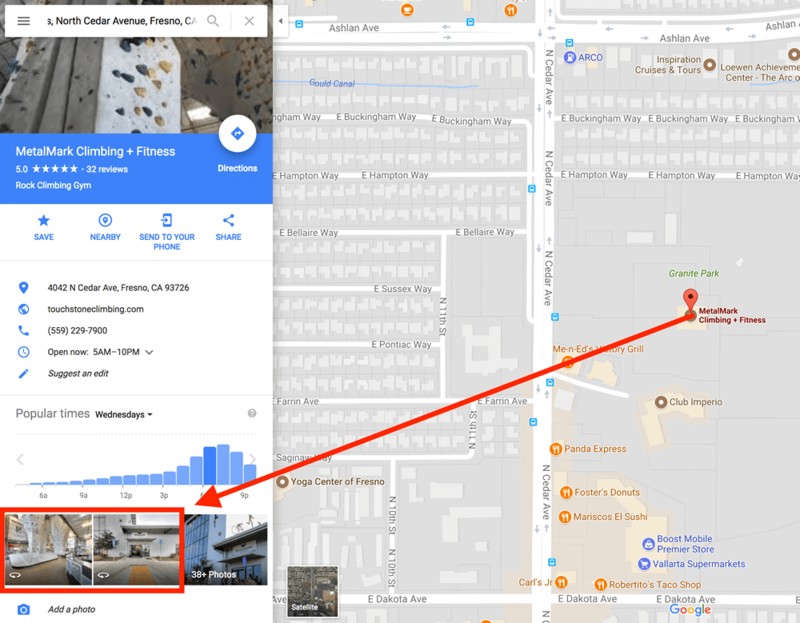 To find your Google listing metrics, simply use Google My Business to see not only your 360° photo data, but all of the data associated with your business’ Google listings (maps, regular search, and Google+). What else can you do with your 360° virtual tour? Consider embedding it into your website. If someone has taken the time to view your website, why not show them around your facility? As quoted by Google earlier, let’s not forget listings with photos and a virtual tour get 2x the interest. Use it as a sales resource. If someone has reached out to you, but not yet visited your facility, send them a link to your 360° virtual tour along with a coupon or introductory offer. 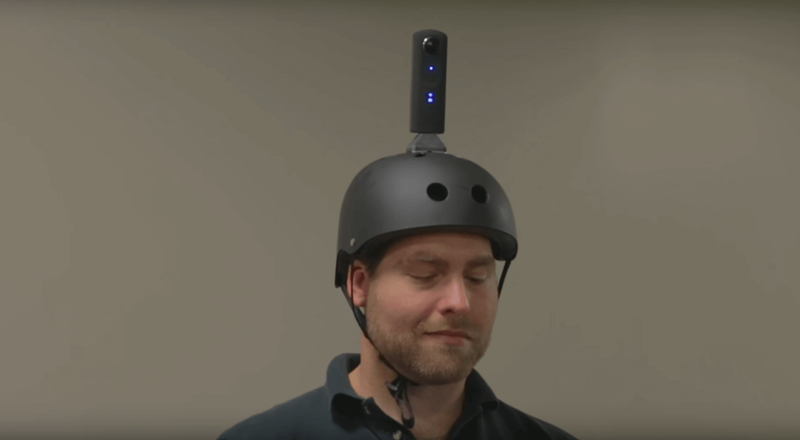 When you get a little more advanced, you can upgrade to the official Google Maps Unicorn Camera Helmet. Just kidding, that isn’t the real name, but believe it or not that helmet/camera combo is very real. If you enjoyed this blog, please feel free to subscribe as we are always posting helpful, behind-the-scenes business tips and tricks for gyms and fitness businesses of all sizes. We also write a lot of helpful e-books! They're all focused around running a successful gym or fitness business and they're totally free. Check out our gym business e-books here.